Plate Tectonics: Introduction The world is split up into large plates, and their respective movements are called Plate tectonics. These boundaries caused the severe earthquakes that Iran endures year after year. Boundaries can push, pull, or slide against each other. The energy that is released from the boundaries results in earthquakes. The more energy released, the higher the magnitude of the earthquake. From this map, we can see that many of the earthquakes are concentrated in the southwestern border - but with this map of Iran, many of the cities are near this coast, amplifying the potential for hazards. 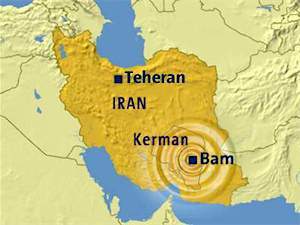 Bam Earthquake Tectonics The Bam earthquake occurred as the result of stresses generated by the motion of the Arabian plate northward against the Eurasian plate at a rate of approximately 3 cm/yr (about one inch per year). This consistent stress as well as release of energy is why Iran consistently has earthquakes. Deformation of the Earth's crust in response to the plate motion takes place in a broad zone that spans the entire width of Iran and extends into Turkmenistan. This again makes earthquakes more dangerous, as much of Iran is effected.